Madam Fancypants is back and someone has stolen her priceless painting! 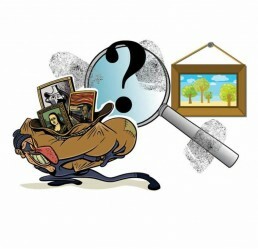 Join us for this mysterious edition of “I Spy …” A Scavenger Hunt” in the King William neighborhood! “Detectives” will get a pair of binoculars to use for finding the photo clue on their “hunter’s map.” Find all the clues, fill out the puzzle to find a hidden message, and solve the mystery! First, second, and third place individuals from each age group will be awarded medals while first, second, and third place teams (2+ team members from either age group) will be awarded certificates. All detectives will be treated to yummy refreshments at the finish line. Registration is required and space is limited, so please call (210) 223-9800 or email villafinale@villafinale.org to register. A parent or guardian must accompany children. The program is designed for two age categories: kids 5 – 8, and 9 – 12 (each group receives age-appropriate activities).